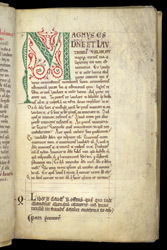 The first section of the 'Confessions' begins on this page, with the words, "Great thou art, O Lord, and greatly to be praised," indicating the book's theme. In the lower margin, the inscription identifies the manuscript as the property of the cloister of "Roffens"--the latin name for Rochester. Following this, an anathema curses any one who tries to steal it and is signed by "Peter, the precentor," who gave the book to the cathedral.